My buddy Adrian and I ran our Heraclea game again today up in Seattle. Scott M. and Gene A. ran the Epirotes and Chris P. and James R. ran the Romans. Although played on a 6 feet wide table instead of the usual 8 feet, the set up was essentially the same. 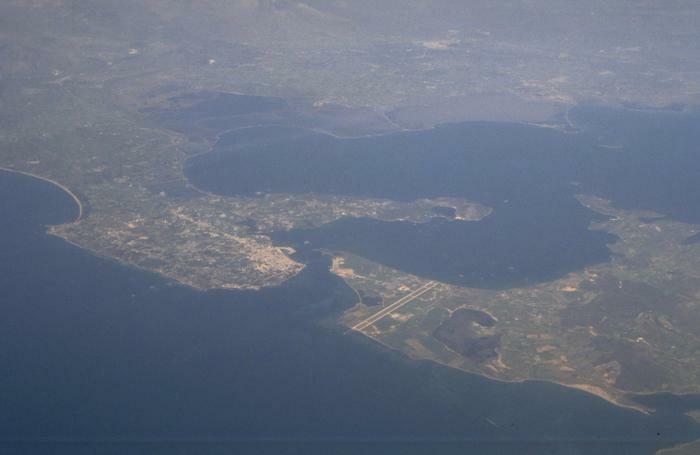 Adrian did rebase his Roman maniples into two-ranks with wider frontages, and the river bend was switched to the opposite end (Epirotes' left). The Epirote right and center was played very conservatively by Scott - at least initially. However, this later changed after he lost both his Hypaspists and Companion Heavy Cav Wedge in the same turn. The Companions were lost after choosing to flee out of enemy territory - he had to do this as he was about to be flank attacked by Roman infantry. This was after having to follow the Roman Cav unit which was defeated in combat, but chose to Give Ground. I don't particularly like this rule - as I've stated before; and this game confirmed it. The Companions rolled an ultra low 4 (using 3D6!) 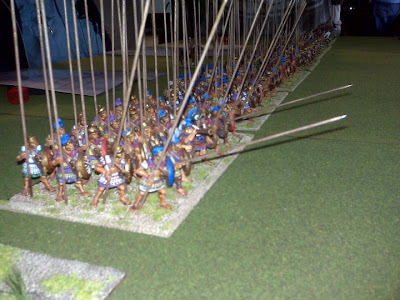 and the Roman infantry easily caught and destroyed them. The Hypaspists were killed off in similar fashion. They chose to fire and flee, but again a low die roll allowed them to be caught and destroyed by an inferior unit. Luckily the two elephants held in reserve got into the fray and took up the slack and did very well on the Epirote right flank. Unfortunately, I wasn't able to take any clear pictures of the action. Gene did very well on the Epirote left - aggressive tactics and not too shabby dice rolling. We called the game at the end of Turn 5. The Romans narrowly won by the total number of points of units killed. The Epirotes probably had the advantage prior to losing their two best units - the Companion Cav and Hypaspists; although the elephants did surprisingly (for me) well. I had envisioned them stampeding into their own ranks after pin prick missile wounds. They ended up showering the enemy with their missile weapons, as well as causing fear and panic into the Romans. Here are some photos I lifted off of Chris Pramas' Facebook - he took them with his cellphone, but just as good as the ones I took with my camera - the area we were in wasn't that well lit. 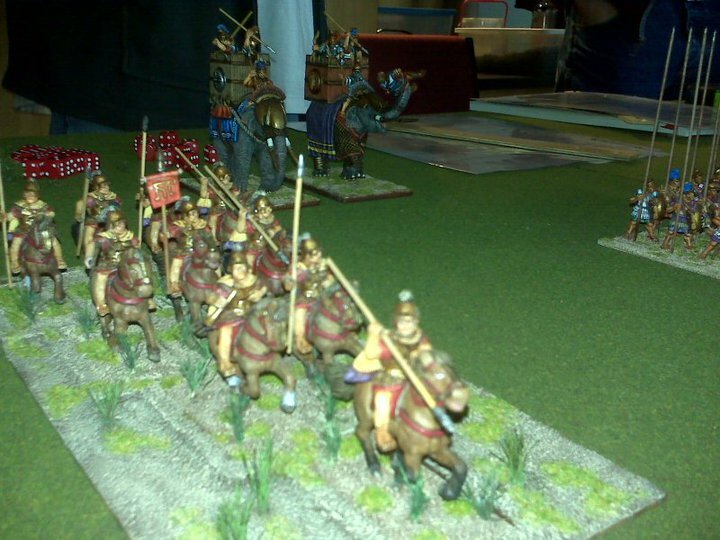 Close up of the Companion wedge; followed by them charging - actually counter-charging - into Roman cavalry (played by Chris). I need a nice figure to represent Cineas - the character leading the wedge;. The standard was moved to the center, third row - easier to spot as the actual center of the wedge for turning/wheeling. 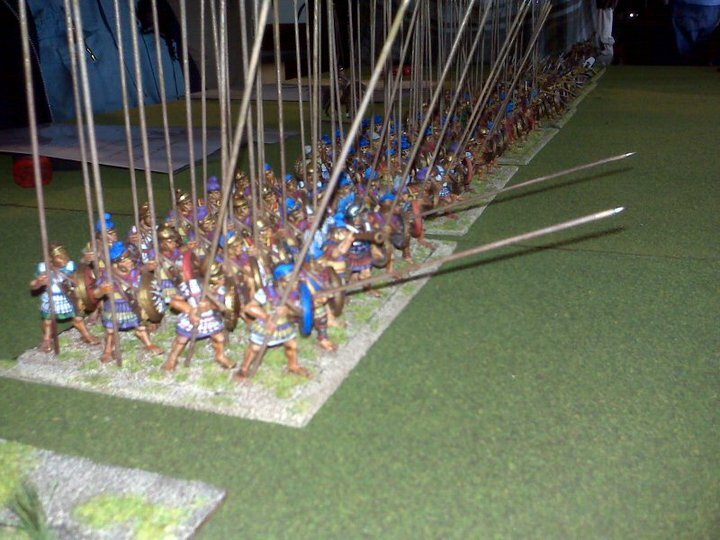 Close up of some of the Epirote phalanx battle line. Romans don't like them much. Yay, some pictures of elephants - thanks, Chris! Kevin Smyth brought up the Langton 1/1200th Ancient Ships, which he offered to sell to me and Adrian. They were a bit smaller than we had imagined, but the detail is as good as we had hoped; we will now be ordering more for our Roman Seas game. These are the ones I bought - Adrian got four (all painted very nicely by Kevin years ago - he even painted the eyes on the bows of the ships!). Just a quick update - mainly to prove to myself that I'm going to finish this project. Managed to pick up a brush today after not touching one for about 2 weeks. I had planned to finish up the horses, but I had a lot of left over red from doing the dog-tooth pattern on the shabraques. Not wanting to waste the red, I painted the dolmans on the riders. Well, that made me want to see how the basic colors of the uniform would look - for the 9th Regiment. Probably won't touch them again until next week as I'm going up to Seattle tomorrow for a game day hosted by the Metro Seattle Gamers. My buddy Adrian & I had another round of playtesting the 2nd E. rules for an upcoming game we're hosting next week. 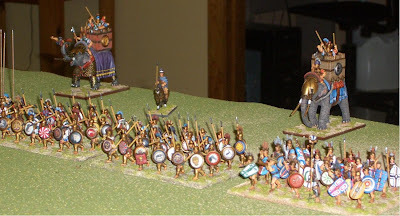 It's the same scenario of the Heraclea game we hosted at Enfilade! - but we used 1.5 rules for that one. We had already tried out the new rules before, but it was with our Shieldwall armies. The forces from the initial set up. We decided to adjust the Epirote start line to be 18" from their edge - the width of the table is five feet. 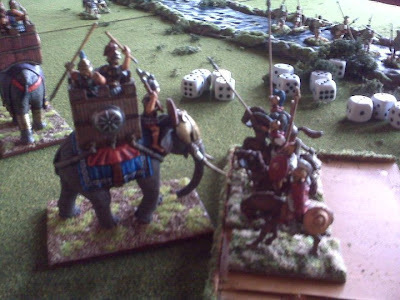 The elephants will be allowed to start at 9" from the edge - no closer than 8" from the Tarantine light cavalry on the left flank. 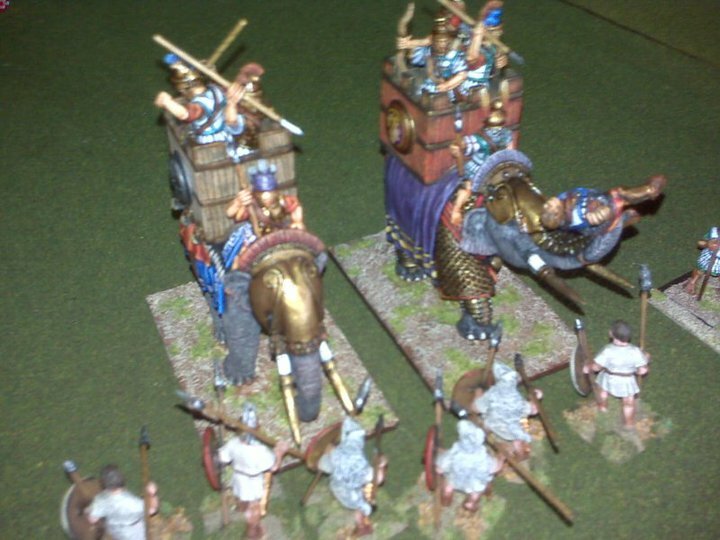 Pyrruhus' horse and the Companion wedge are considered used to elephants. The Epirote battle line. From the right flank: Companion heavy cavalry, Epirote and levy phalanxes, Mercenary Greek phalanxes, Tarantine light infantry, and Tarantine light cavalry. 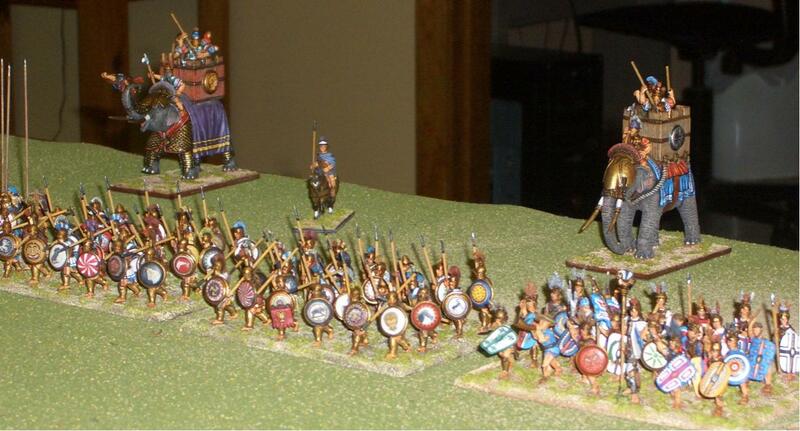 The center of the Epirote battle line - Merc Hoplites and Tarantine light infantry in the foreground; the Eagle King and elephants in reserve. The Roman battle line moving across the Siris River. Light cavalry and skirmishers already across the river screening. Hypaspist, Cretan archers, and Mercenary Peltasts advancing on the Roman skirmishers. View from the Roman right. It was very interesting playing out the subtle changes which have some significant implications. 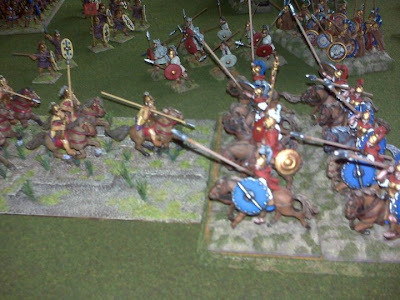 For instance, my cavalry wedge won a round of combat and having passed their leadership test, the Romans opted to "Give Ground." This new rule, which is applicable to cavalry and drilled infantry, has the loser of the round roll 2D6 movement back and still face the enemy. The winner then has to move forward his normal movement. Luckily, Adrian rolled low and the wedge unit moved back into contact with the enemy. However, this was now in enemy territory with enemy supporting units which could easily flank attack the wedge in an upcoming turn. Granted, if the unit giving ground hits an obstacle, such as another unit, it would then have to flee. Anyway, it's something to be aware of - the winner of the round of combat is kind of drawn into the enemy's grasp. At least the losing unit which gave ground cannot charge the next turn - it's considered too worn out and disorganized. I would much rather have the winner be allowed to choose if he wants to "pursue" or not after the enemy gives ground. After our game next weekend, we'll be planning on trying out the unofficial WH Napoleon rules. The goal is to host a WH Napoleon game for the Truants. We also discussed to try a true skirmish game using WAB for an early-Samurai game. I'm thinking of something along the lines of the Raid on Sanjo Palace in 1159. Oh, and also the Actium game using Roman Seas. We'll be getting some Langton models soon. I couldn't wait to finish painting (or even start on) the horses, before going on to putting the riders together. Besides the officer and bugler on the command sprue, there are four identical sprues with three riders. All have several types of heads and headgear. There are three types of bell-topped shakos - one with the diamond plate, one with the earlier large tricolor cockade, and one enclosed in a campaign cover. The first two types have tall feathered plumes, cords and raquettes. The campaign one has a ball pompom. There is also heads wearing the mirliton, the later (post-1812) cylindrical shako, and finally the elite type with colpack. There are three torsos, separate right arms brandishing sabers, pelisses, and two choices of legs - one in full dress breeches and boots, the other in campaign trousers. Separate sabretache/scabbard pieces complete each sprue. Here is one of these sprues. The next photo shows the basic components (less the sabretache/scabbard piece) for each rider. This particular head choice is the elite type wearing the colpack. I chose to have the officer, bugler and six elites (with colpacks) in full-dress. That is, with breeches and boots. The remaining six troopers are wearing campaign trousers with buttons down the sides (as well as a stripe). All have pelisses slung over their left shoulders. Note the illustration of the 9th Hussars trooper in the foreground of the page on the right. 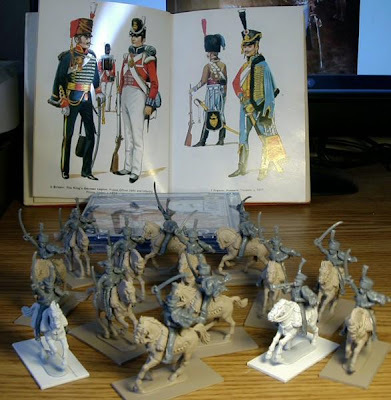 The book is Uniforms of the Napoleonic Wars by Jack Cassin-Scott. My mom bought me this book when I was a kid and I've kept it ever since. Still very inspirational after all these years. Here's a close up of an elite and line trooper. Notice the breeches and trouser details. You may notice that two of the horses are primed in white; these will be grays for the officer and bugler. The others will be given a brown stain/wash. 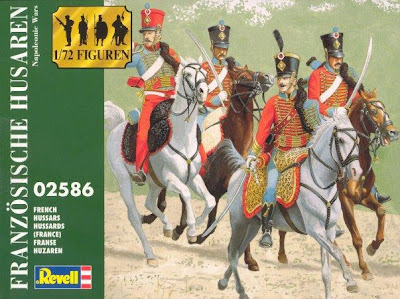 Speaking of the 9th Hussars, this is the regiment that I plan to paint these guys as - always liked them since seeing that illustration above. Apparently it is a popular unit as the Perrys chose to use it as the artwork for their box. It is also used on a set of Revell 1/72nd figures - see the picture below. I posted a question (more like a testing of the waters) on TMP about decals or transfers for sabretaches. It was met with a fair amount of like-mindedness. A generous TMP member, Paleovento (Aldo from Veneto, Italy) posted a link of sabretaches designs he made for these very models - go to the bottom of the post and see his beautiful work. I plan to print out the ones for the 9th and glue them on; this will spare me much heartache and wasted time. Also, Steve at LBMS PM'd me on TMP after seeing the post, and said he is working on the very thing right now - he was kind of surprised I posted that and thought I was a mind-reader. I wish. So, if you rather not hand-paint sabretaches (and who really would), you have two choices, one is available right now thanks to Aldo, or you can wait for the one from LBMS - which I am sure will be quite beautifully done too. Finally got around to start on these puppies. Horses up first. 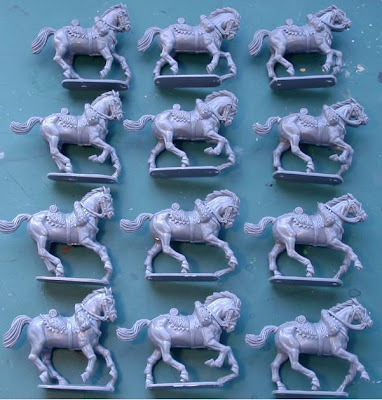 Besides a command sprue of two horses - one for the officer and the other the bulger, I presume - there are four identical sprues of three horse figures - each in two halves. So, you could build nine "unique" variants and duplicate three of them - which is what I did. Funny how I stink at math, but managed to figure this out. 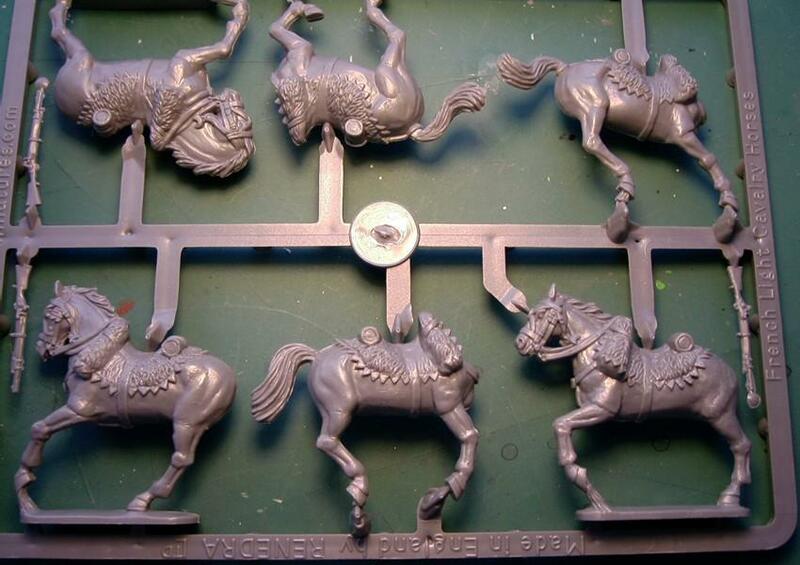 This is one of those sprues of three horses. The sprues also come with three carbines - so make sure you don't chuck them after removing the horse parts. I used a wire cutter to remove the parts but, a slender-nosed sniper would be better. I just go with what I have sometimes. The plastic the Perrys use is much tougher than the type Victrix uses. 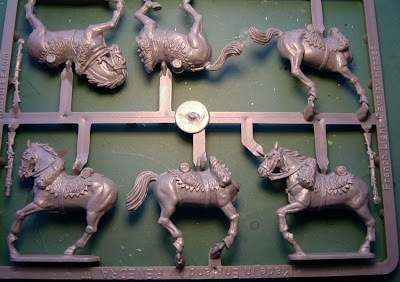 Here are the various horse poses that I came up with from the four identical sprues. These are the two from the command sprue. Note the officer's horse blanket - as opposed to the sheepskins on the rank & file types. 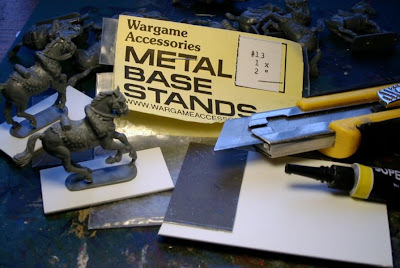 For basing, I used Wargame Accessories 1x 2" metal stands super-glued to plasticard. This way they can be placed on magnetic movement trays, as well as adding some weight to the otherwise light cav. Here's the basic "stuff" for this. Here are the horses mounted to the bases - I used Testors liquid cement to glue them to the bases; the same glue was used for putting the horse halves together. This is better than super-glue for plastics, IMO. They will now get a soapy bath prior to priming. Stay tuned for updates. Finished the mounted colonel, as well as the colors which were downloaded (or uploaded - whatever, the term is) from Warflag.com - thanks guys! A little bit of contrasting strokes of color were added to the flags to make them appear more lively; trying to be similar to the LBMS style. Here's the colonel brandishing his broadsword in front of his regiment; and flanked by his color bearers and musicians. The horse is one that was completed earlier and mounted with an officer that I don't have a regiment painted up yet. So I removed him and replaced him with this Highland officer. I think I erred by painting the piper's kilt in Royal Stuart pattern; seems this may only have appeared a little later - mid-19th Century, perhaps? He'll stay the way he is though, and we'll see what kind of comments we get about him. Aerial view of the entire unit - at least for now. I may end up adding a few more guys; but it's big enough for a small skirmish game against some Perry French Heavy cavalry. On the WAB front, the Epirote army, along with those Successor elephants, are packed up for a playtest next week using the 2nd Ed. changes. This will be followed by a game up in Seattle at a first-ever summer one-day event hosted by the Metro Seattle Gamers at their clubhouse. 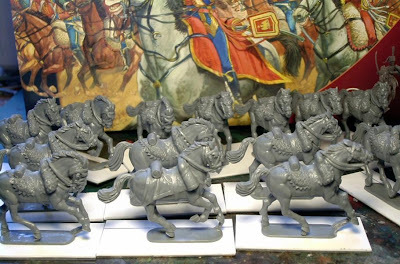 In the paint queue are a box of Perry French Hussars, 24 Foundry Successor Silver Shields, and hopefully some Langton Roman ships. Several weeks ago, a few local NHMGS members who are free on Fridays decided to form an ad hoc group to meet at The Game Matrix and play whatever game we come up with. The name decided on was the "League of Extraordinary Truants." I didn't provide input, as I wasn't sure how far we'd go with it - we've met three times already - I think we should've been named the "League of Urban Truants" or L.O.U.T's. Kevin Smyth, who also happens to be the current Prez of the NHMGS, kicked it off with his Spanish Civil War game - something he holds near and dear to his heart. It was his home-brew rules and truly becomes bloody in the hand to hand phase. The shooting wasn't so deadly - or was it just my crappy dice rolls. Maybe both. Adrian took all of the following photos - more can be found on the Puyallup (War)gamers Yahoo Group . All of the figures and terrain are Kevin's. This one has some Bando Republicanos advancing on my flank with newly arrived Carlists (super troopers) defending the town. The next photo shows Republicanos swarming into a trench line held by low morale Nationalists- who actually held out for little while. As you can see, another Nationalist trench has already been cleared. The next photos are from the game hosted by Mark Waddington last week. It was another fun game, this time a Colonial game set in Africa. Not only were the beautifully painted figures and terrain Mark's, but so were the well written fast-play rules. Along with Mark's son Joe, I played the Germans, whose mission was to get the porters across to the far side of the table. I ran the right flank of the movement, and ran off some Sikhs and a British medium machine gun team from a hill - in spite of my below average dice rolling - yet again. This week's game was another one run by Kevin. It was a semi-historical (is there such a thing?) ACW scenario with land and sea action. I was part of the Confederate forces who held the garrison and town, as well as several shore batteries. My shore battery was out-ranged by the Union ships' guns and put out of action by turn six. This was perfect timing, as the one Confederate ironclad that I commanded came on at the start of that turn (predetermined by die roll). Here's the baby that I commanded - it survived a close encounter with a monitor class Union ironclad run by Joe Waddington. Joe's ironclad left the table due to failing his morale test after suffering enough damage. Not to be outdone by the navy, the land forces are mixing it up too. 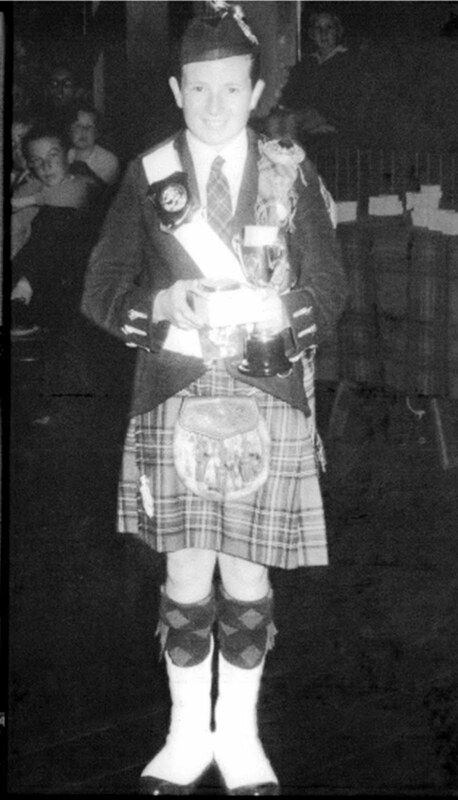 He actually left Scotland at a very young age. He is one of my all time heroes. Of course, it is none other than Ronald Belford Scott, aka Bonnie Scott, aka Bon Scott. As most fans know, he could actually play the bagpipes, and had been a member of the Scots Pipe Band of Fremantle, Australia. 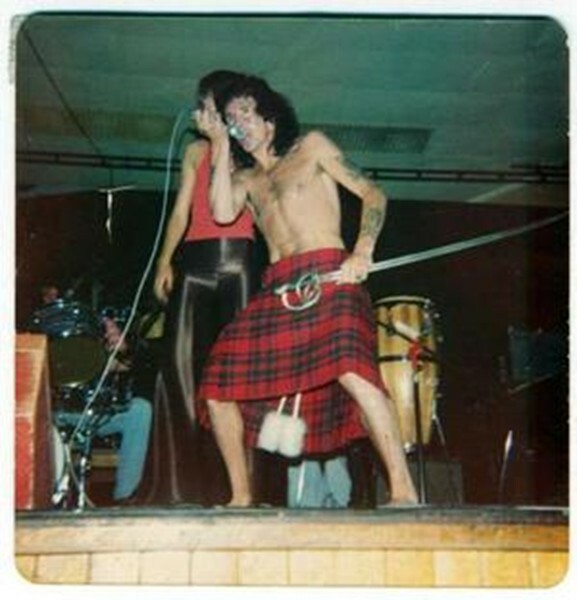 Here's a bootleg video with Bon playing the pipes - sadly, the amateur filmmaker was focused on the audience for most of the short clip. Here's another clip of him goofing with bagpipes, although he is singing live. He made it to the top - unfortunately, he wasn't there long enough. "Shazbut Nanoo Nanoo"
Finally finished these Victrix guys - they were already partially completed, but when the Aventine elephants arrived, work was put on hold. Now that focus will be shifting toward the Battle of Actium and some Langton 1/1200th scale ships, figured if they didn't get done now, they'd be collecting even more dust. Still need to finish the staffs for the standards, as well as getting some 42nd Regimental and King's colours. 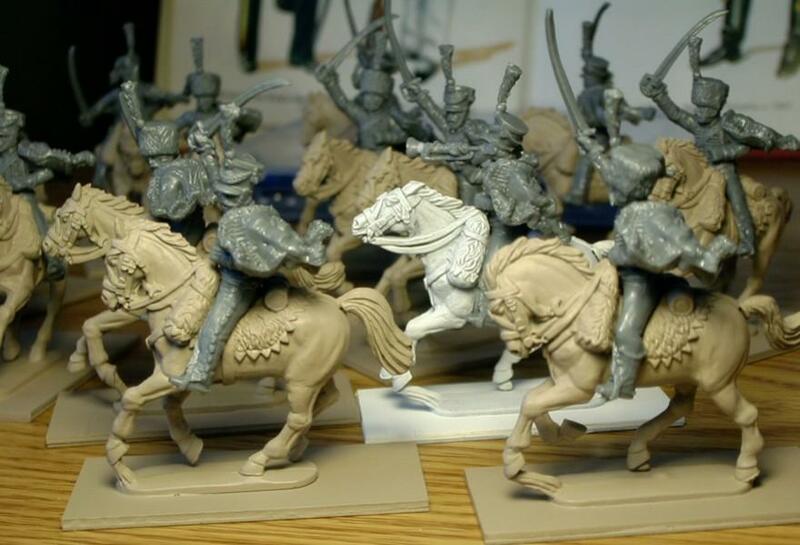 Oh, and there are a couple of mounted colonels that need to be painted too. I'll probably paint only one of the mounted guys as 42nd. The other officer could be a 92nd guy - I have some left-over figures that might be used as such. Not anytime soon, though. I'm not sure of the color of the bagpipe bag - I read somewhere that they weren't tartan pattern. The Victrix box shows the bag in green, but I would've thought the color should be the facing color? After our playtesting of the basic Roman Seas rules the other day, my buddy Adrian and I are in full-sail prepping for a Battle of Actium game. 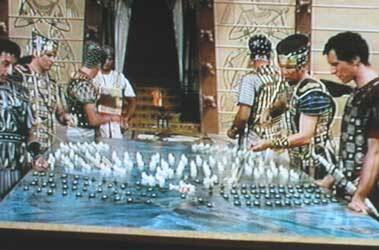 As I mentioned earlier, we decided that 1) We really like the rules; and 2) We should go to a smaller scale than the 1/300th (6mm) scale we played. I sold off the ships and mat with 5" hexes to a gamer in Texas yesterday. I had hoped a sell it to a local gamer, but alas, they only responded to me after the Texan bought it. I'm happy the items are going to a good home and I hope he enjoys it. I put a lot of effort into building the ships and didn't make anything off of the sale - actually lost a bit considering the postage. I used some scavenged USPS priority mail boxes - cut up and inside out, but the wily (& penny-pinching) clerk saw the "Priority Mail" logo printed on the inside of the box and said he had to charge me the priority mail price anyway. I said next time I'll spray paint over the logo - he looked like he'd go postal on me :)! Anyway, now that I have a little cash from the sale, some Langton 1/1200th scale ships will be purchased. Also, another Hotz mat, larger than the previous one, and with 3" hexes. 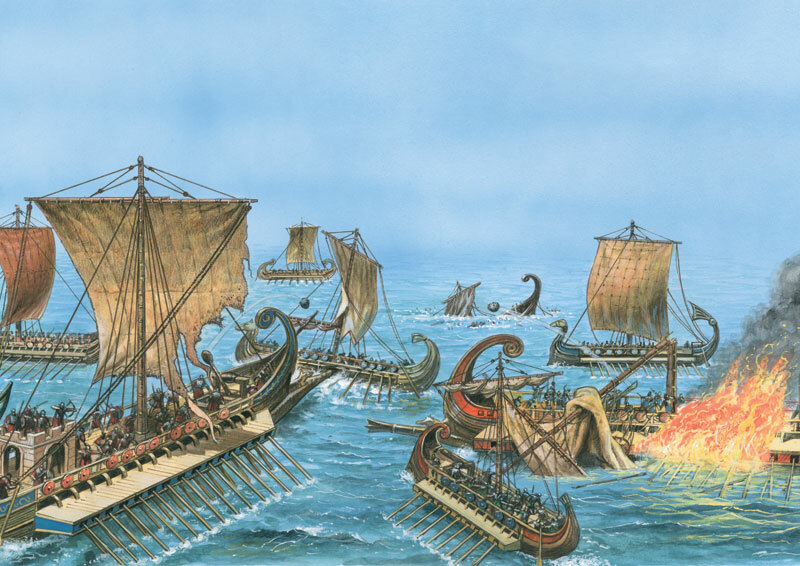 These larger ships had fighting towers and also grappling hooks that could be fired from ballistae. 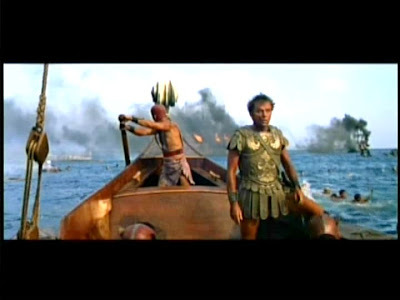 While awaiting the arrival of Octavian's fleet, many of Antony's men had died or become incapacitated due to an outbreak of malaria. 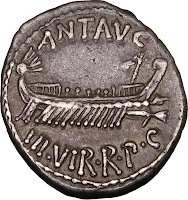 This depleted Antony's crews and he decided to burn most of his smaller ships, and consolidate his remaining effectives onto the larger ships. The larger ships should have had an advantage for ramming tactics, but supposedly due to the shortage of crewmen, they weren't able to reach the maximum speeds. 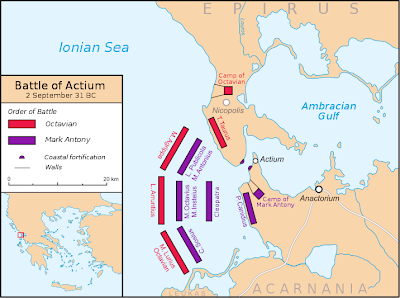 Coupled with this, one of Antony's officers defected to Octavian on the eve of the battle, and provided him with Antony's battle plan - basically to corner and destroy the wing of Octavian's expert admiral, Agrippa. Octavian's entire fleet being aware of this, never allowed it to happen. 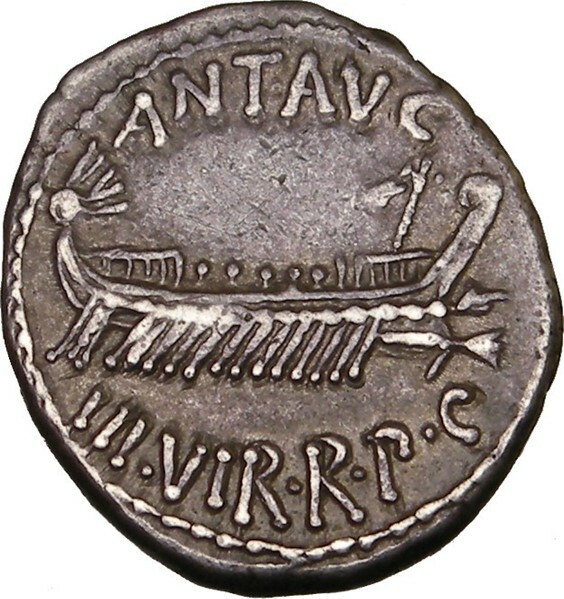 This is a period coin with Antony's name at the top and an image of a warship with what appears to be a raised corvus near the bow.